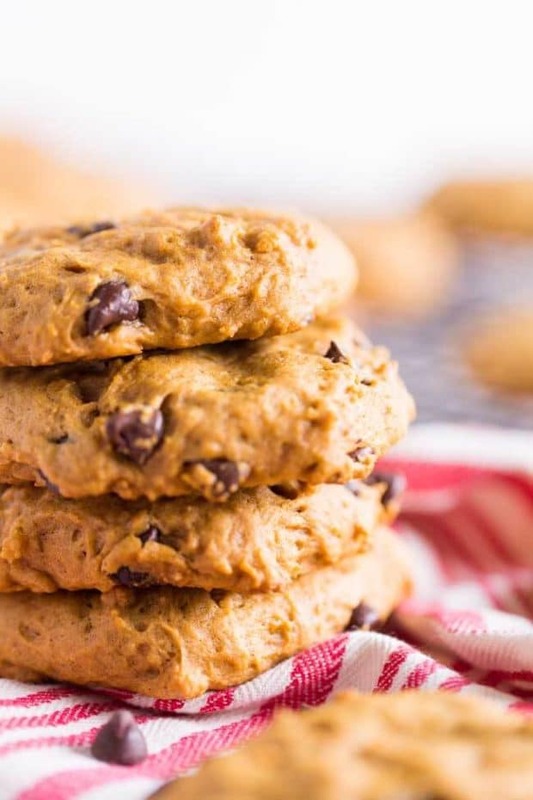 These old fashioned, soft pumpkin chocolate chip cookies are a family favorite! The crisp fall air signals it’s time to slip into the kitchen and pull out a favorite fall recipe. 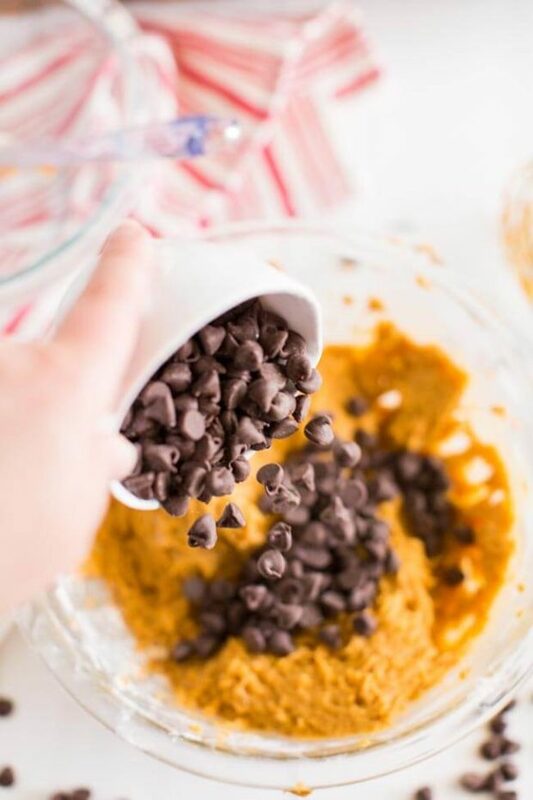 This easy version is for my favorite soft pumpkin chocolate chip cookies and they are delightful. 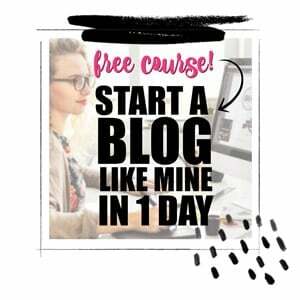 You’ve got to try them! The soft pumpkin cookies are moist and almost cake-like. When served with a glass of cold milk, fresh from the oven… you guys. They’re the best. They melt in your mouth and leave you with autumn’s glorious pumpkin spice taste. And if you’d like a chewy version, I have some suggestions for that, too. Pumpkin is a favorite for me.. so when paired with chocolate, I’m in heaven. This simple, from scratch recipe makes soft, fluffy, cookies that will leave your mouth watering for more. Kids will love helping make, and eat, these Sweep the Kitchen Cookies. These Double Chocolate Chip Cookies are packed full of chocolate and are perfect for chocolate lovers. We’ve gathered up 20 Kid Approved Pumpkin Desserts you’ll enjoy as well. I love to bake. Cookies were the first things I ever attempted to make and my family bragged on me big time. Success begets success and I suppose that has something to do with why I love to bake. 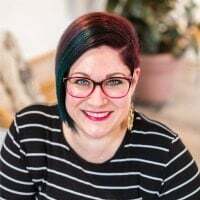 A mom has got to have some easy wins! 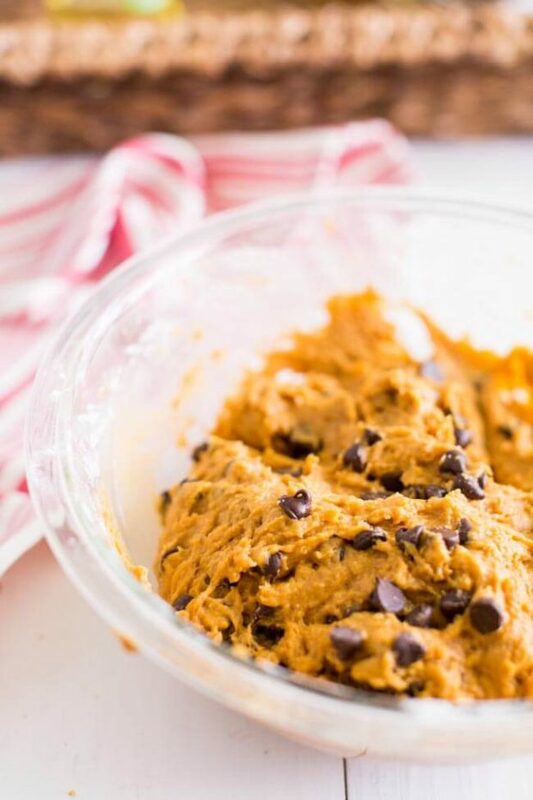 And if you’ve never tried pumpkin flavor cookie dough…you really should. Just don’t let your kids see you or you won’t end up with any baked cookies. I bet you’ll have these staples in the cupboard already so we can get started. 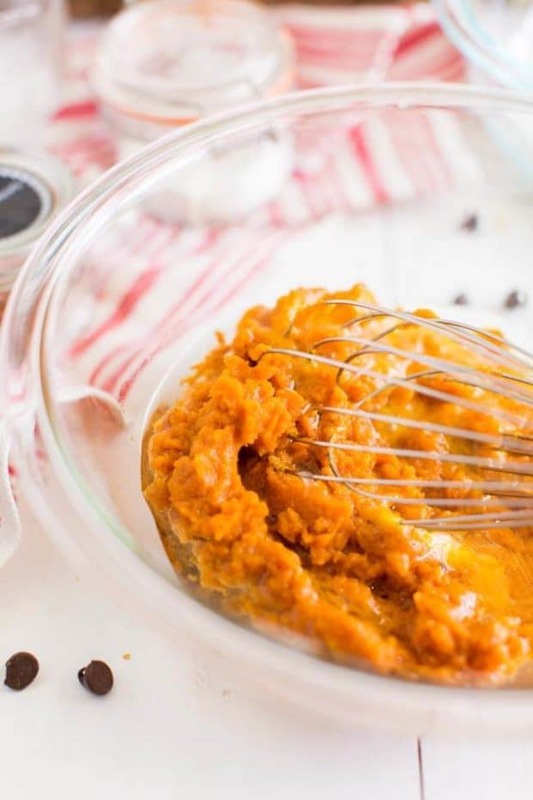 You’ll need sugar, vanilla, egg, vegetable oil, cinnamon, salt, baking powder, baking soda, flour, semi-sweet chocolate chips and canned pumpkin. Are your taste buds revved? This is how to make scrumptious cookies. 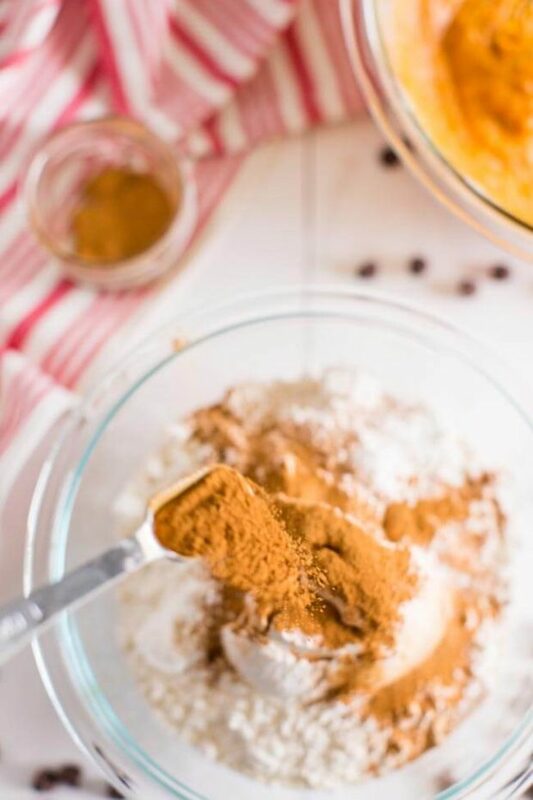 Combine sugar, flour, baking powder, baking soda, cinnamon, and salt in a medium size bowl. Set it aside. In a separate large bowl, mix the egg, vanilla, oil, and pumpkin. Truth in the kitchen: sometimes (most times) I’m in a hurry and I do not want to dirty a second bowl. On those days I start with the large bowl and wet ingredients, then I add the dry ingredients to the same bowl. But I don’t just dump the ingredients in one spot. I sprinkle them all around the bowl so there’s an even distribution. I suppose a professional baker would frown on my method but it works for me! Next, fold in the chocolate chips; turn the oven on to 350 degrees and then let the batter rest for about 20 minutes. Scoop heaping tablespoons of cookie dough onto a greased cookie sheet. Use parchment paper for easiest clean-up. Bake about ten minutes; adjust depending on your oven’s calibration. Your kitchen will smell amazing; your mouth will water. Children will be drawn to the kitchen as if they were responding to some primal call. You will feel like a benevolent fairy godmother, bestowing gifts on her charges. Bask in the glory. One good thing leads to another. Remember I said success begets success? It’s time to freelance. 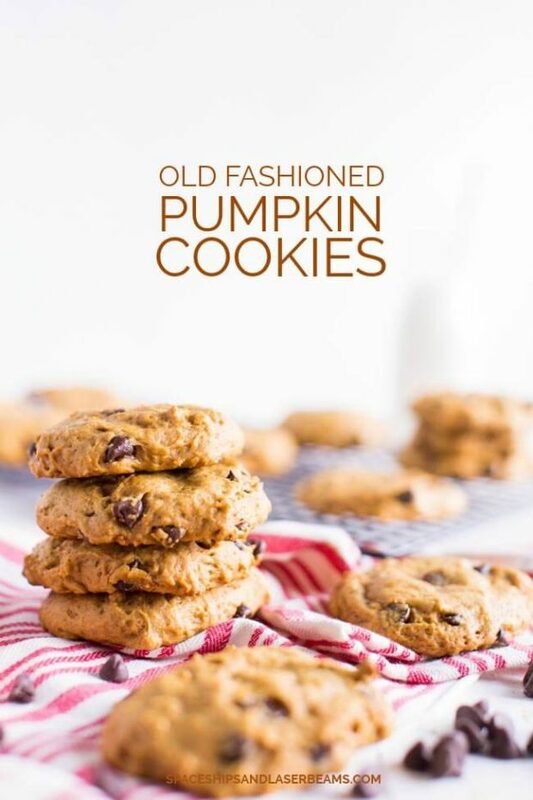 If you want a chewier but still soft pumpkin cookie, try adding about a half cup of quick oats. And don’t forget the raisins. Or cranberries. Or chopped dates. You might want to mix in chopped walnuts or pecans, too. Use white chocolate chunks instead of the chocolate chips for another taste treat. Or if you are really feeling wicked, use both. And you adventure seekers will want to play with spices. Try one or more of these: pumpkin pie spice, nutmeg, ginger, cloves, allspice. Now some prefer eating these orbs fresh and warm from the oven—but I know of one friend who insists they are best after they have cooled in the fridge. My advice? Try them both ways. Have them with milk, coffee, tea—or just a big smile. But for sure, before sunny autumn days turn into Earl Grey winter, stick a few of these soft, old-fashioned pumpkin cookies in your pocket. Get outside and take a walk. I highly recommend enjoying blue sky, kicking through colored leaves, and nibbling your way through a beautiful afternoon. These amazing cookies will become an often requested favorite for your crew. Combine all dry ingredients in a medium sized bowl, and mix. In separate large bowl add all wet ingredients: egg, vanilla, pumpkin and oil. Mix until well combined. Let batter set for 20 minutes. Scoop cookies about two tablespoon size onto a greased baking sheet. Bake for 10 minutes (time may vary with different ovens). 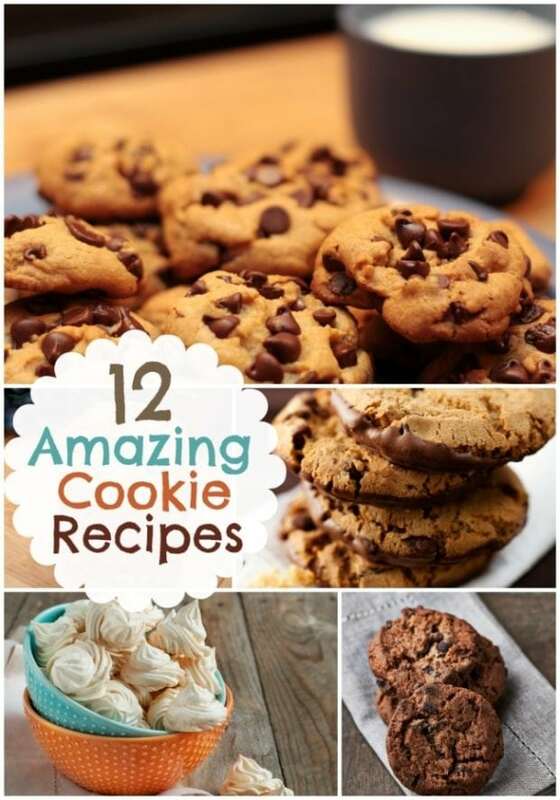 Check out more great cookie recipes.